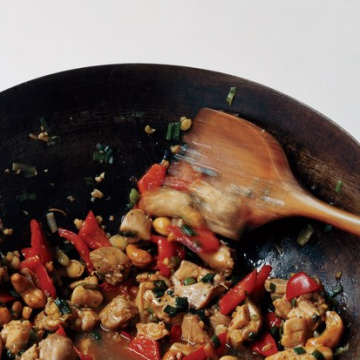 This otherwise straight forward chicken dish gets a boost from a restaurant, inspired sauce made with cashew, torn white bread and tart lemon juice. Make the spicy walnuts: Preheat oven to 300°F. Melt butter in a small skillet over medium, remove from heat, and mix in salt and cayenne. 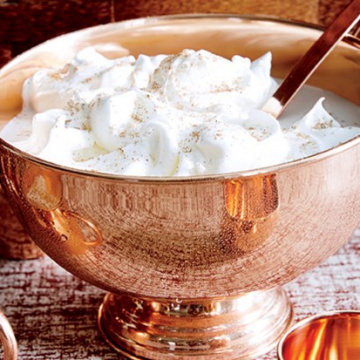 Whisk egg white in a medium bowl until soft peaks form; stir in brown sugar. Add seasoned butter and walnuts and fold to coat nuts. Spread nuts out on a parchment–lined rimmed baking sheet; bake, tossing every 10 minutes or so, until mixture is dry and nuts are toasted, 25–30 minutes. Let cool. Make the cashew tarator: Increase oven temperature to 350°F. 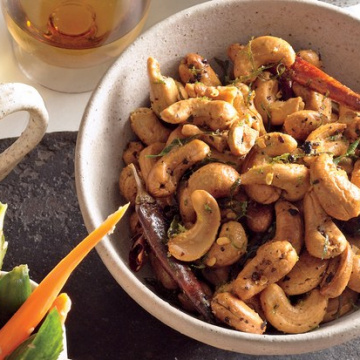 Toast cashews on a rimmed baking sheet, tossing once, until golden brown, 8–10 minutes. Let cool. Pulse cashews, bread, garlic, lemon juice, coriander, and 3/4 cup water in a food processor to combine. With motor running, stream in oil; process just to incorporate. Pulse, adding a splash or so of water if too thick, until a coarse purée forms; season with salt. Make the chicken: Increase oven temperature to 475°F. Heat butter and 1 Tbsp. oil in a large skillet over medium-high. Once butter is foaming, place chicken in pan, skin side up. Tilt pan and spoon butter mixture over chicken until the entire surface is coated. Sprinkle with a generous pinch of salt and transfer to oven. Roast chicken, rotating pan halfway through, until skin is golden brown and an instant-read thermometer inserted into the thickest part of a thigh registers 165°F, 25–30 minutes. Transfer chicken to a cutting board and let rest 5 minutes. Meanwhile, toss celery, celery leaves, mixed seeds, lemon juice, and 1/2 cup spicy walnuts in a medium bowl. Drizzle with oil, season with salt, and toss again. Spoon tarator onto a platter and top with celery salad and chicken.s and place a portion of salad alongside.